Buona sera. Do you know that old group of Clapton's and Winwood's called "Blind Faith"? Well, this has nothing to do with it. I have a lesson, with some illustrations from my recent experiences in Trollsville. Sounds like a new game from Zynga, doesn't it? Well, my game was unpleasant, and yet, there were laughable experiences. Here is the point, then I will explain it: You can become so blinded by hate that you miss out on some good things. If your criteria for whether someone is "acceptable" to you is based on qualifiers, be careful. People have chosen to hate me because I am a Christian, because I am not (denomination), because I am a Conservative, because I work for — waitaminnit, you almost got me there. Can't tell you that. But what good is it to have such severe limiting factors? "You Xtians are all stupid and worthless, neener neener!" That guy is missing out on valuable information. Just today, I heard Alistair Begg give some very practical comments about financial freedom. It doesn't matter if you're a "believer" or not, Alistair said some useful things and Carl Cretin is missing out because he's rejecting the information because of who is giving it (Genetic Fallacy). Frankly, it's all due to pride. How dumb can you get? If they had clicked on the guy's name in the comments, they could go to his profile, and then to his Weblog where he (lamely) ridicules me. What, then? Am I creating an entire new name and many posts on another Weblog that disagree with everything I stand for on this one? All because the site had been locked down whenever he tried to check the comments. If he had checked during the right week or so, he would have found out that the comments were indeed open for a while. I suppose that he's giving himself Godlike knowledge, thereby having the power of God, in whom he disbelieves. Agonizing. "It's your multiple personalities acting up again, Cowboy Bob!" Now you people have Lela taking a shot at me. The difference is that I know she's not being mean-spirited. One thing struck me, however. Was this guy so bad at attacking me that the other atheist trolls could not believe that he was real? If they could get past the source, some practical advice is to be found for them in Galatians 5.15. Remember Neil's adventures with that welfare slob that likes to throw punches? (I have to find another name for her that is not profane, but the old one had the initials of "BB".) Although it grated on him, Neil could admit when this childish adult was actually in the right on some things. He wasn't blinded by hate. No good can be had by forcing someone to conform to your own mold, your own construction of what a person of (whatever) persuasion stands for. "Christians are supposed to...", and , "Aren't Conservatives supposed to...?" That's neurotic, Nelly. Take people for what they are, not for what you think they should be. Especially if your judgment is clouded by hate, you cannot see the actual person or any truth in what is said. Well, I've long believed that if someone is going to think (or say) evil about you, there is nothing you can do about it. I've seen cat fights where one girl gets into another's face and yells, "I hear you been talkin' 'bout me!" So? You can't stop it. But what can be done is to live your life, do what's right and let someone with sense see that your critic is being a fool. United States Air Force in my Waffle! Buona sera. Hey, what do you get when you cross an atheist with a Jehovah's Witness? Someone who knocks on your door for no apparent reason. Ha! Love that one. (Insert Larry the Cable Guy voice): I don't care who ya are, that's funny! You're not going to believe this. 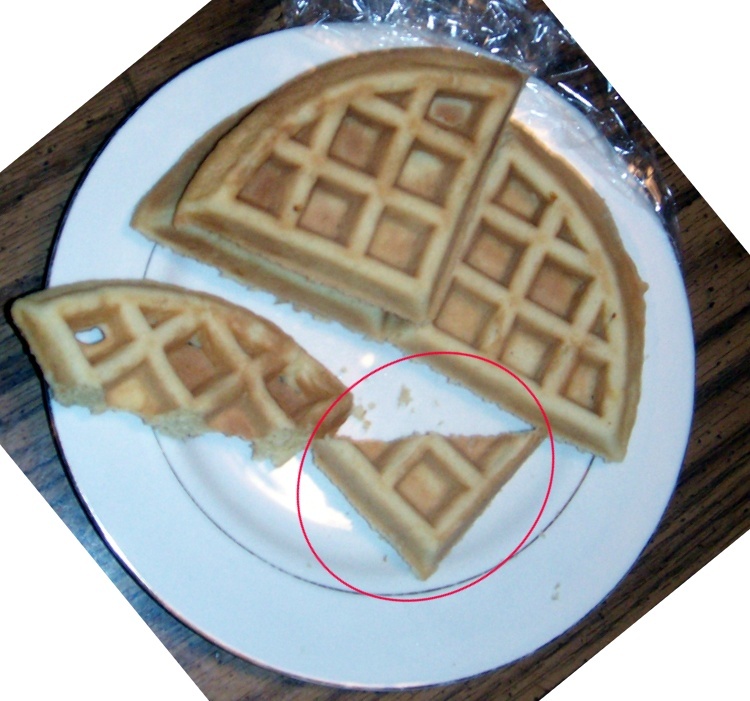 With the merging of technology and magic, the United States Air Force has made a holy relic in my waffle! Even though it's officially retired, I still think it's cool. What will happen next? I love miracles of technology! They send a tingle down my leg, just like Obama does to Keith "Leftist Nutcase" Olbermann. Do more than ten people watch that show anymore? There's one very serious problem with this, aside from the fact that the mind can create images where there is nothing (like when I unfocus my eyes while staring at the couch and see a face in the pattern). That problem is very simple and basic, that nobody knows what Mary looked like! Just like when people see images of Jesus in things. Those images are based on imagined resemblances to paintings of imagined images, capice? Nobody knows. So, unbelievers and disbelievers, you're right on this. "Religious" people need to focus on the Word of God, and not get wrapped up in imagination and silliness. That cheese sandwich pictured here was sold for quite a few grotzits. I could have had good money for my stealth waffle, but I was hungry. Excuse me. I am very, very sad right now. Just found out that I lost a friend. Well, I considered Dana Key, the lead singer and guitarist of the Christian band DeGarmo and Key a kind of friend. Met him after concerts (and once before) about three times. Great show. (Greg Morrow was drumming for them, look for him on the credits of Van Zant's latest albums.) He's gone now, dead on June 6, 2010 at age 56 from a blood clot. Some people say that people do not grow spiritually when they're into any kind of rock music. Well, Dana was another one that became a pastor. He was one of those people that you could see it in his eyes, felt like he was looking into me. Startling the first time it happened. These guys meant what they said, and had the courage to sing about Jesus. For that matter, I remember when they released a 2-for-1 deal — buy the tape, there is a second one inside the package for you to give to "an unsaved friend". That has always impressed me. I came back to my faith a few weeks ago. Part of what brought me back was music by DeGarmo and Key. Back in 1978, I remember the guy at the Christian bookstore in Lansing, MI showing me the new album, "This Time Thru", by the then-unknown DeGarmo and Key. So, they've been important to me for 32 years, except when I had put my faith on the back burner. But they had retired from music just about that time, so I didn't miss out on many tunes. Even so, DeGarmo and Key and the band ministered to me (and many others). When we meet again (this time, in the glory that he proclaimed), I'm going to ask how he did some of those guitar licks. When he wasn't doing the lighter pop music, he could fit in with the best of the secular rockers! The video below gives a sample of the skill of this direct descendant of Francis Scott Key. Good write-up and touching comments here. Also see the tribute here. Addendum: My follow-up on June 6, 2011 is here. Only losers could believe in such." — "All the Losers Win"
Buon giorno. Been getting myself in trouble with the crew. Grousing to Lela, Hal the Hacker, Tommy the Knocker, Billy the Baptist, Rowdy Ralph, Tommy the Knocker, Nicky and the others... they told me to put it into writing so they don't have to hear me. I'm in the mood for a little grumbling, making the sound of a distant thunder. Most are small. Sure, I have plenty of things that I can rant about, such as people who use bad reasoning but cannot see it, double standards of the Hollyweird leftists (sure, complain about Bush at every turn, not a peep about B. Hussein Obama's failings in dealing with the BP situation), the way PayPal is letting finances for terrorist lovers go through but shuts down their account with Atlas Shrugs and other anti-jihad sites — but I want to let other people handle those so I can go after must less important things. Except one brief comment of something bigger. Can the criticism of Elton John for playing at the Limbaugh wedding, willya? People got along, they liked each other, everyone had a good time and so on. Also, Elton said that he was there to "build bridges", according to Rush's account on today's broadcast. So, you hateful leftists, where everything is supposed to be peace, love and grooviness, you are way out of line, capice? OK, now the small stuff. It really grinds my gears when I hear amplified and often processed eating sounds. I was raised to chew with my mouth closed and not to talk with food in my mouth. 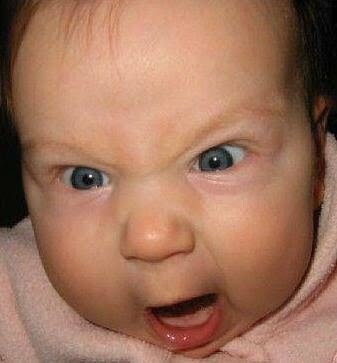 When my relatives sound like jungle animals grunting over the kill in their "see-food diets", I get aggravated. When things like the Kit Kat candy bar commercial come on and I'm subjected to "CrunchSmackSnarfGrind", at least I can shut off the volume on the telly and wonder why they have to lie to us with amplified, processed crunch noises. OK, so Kit Kat is crunchy, I get it, no etiquette. Another gear-grinder is when, despite my repeated attempts like this one, people don't listen and insist on forwarding a forward of a forward. When (if!) you finally get to the message after wading through everyone else it's gone to, it's full of border lines |||| that make it || very annoying to read. Related to that, the forwarded letters with a blonde-haired, blue-eyed "luck angel" or some similar nonsense. Blackmail! Send it to everyone in your address book in three minutes and you will have something wonderful happen to you at 21.58 tonight. Otherwise, Jesus will drown a kitten. Spare me! I know, I know I've talked about this, but I can always hope that someone will take the hint. People who want to debate on Twitter. That really grinds my gears. I mean, sure, the occasional exchange of comments is one thing. But to try and debate or have a lengthy discussion? My Twitter activities are automatic postings from my Weblogs, the others are "drive-by" at best. I was hit with stuff like, "Your article assumes that evolutionist is not fact and neglects to mention genetic evidence which proves common ancestry". It has plenty of things I could debate, but not on Twitter! Also, I had a comment from someone who's purpose is to destroy religion (his "bio" says, "Showing the harm of religious beliefs"). When I called him on it, he said, "That's not true, I hope to raise questions in their mind—but I also hope to show that 'atheist' is not the same as 'immoral'". Yeah, really useful to do this on Twitter. Except that I think both of those guys are just stringing me along. Slightly edited January 1, 2018. Buona sera, wherever you are. Uncle Bob is really burned up about something. No, that's wrong. I want to say that today's topic is about bad science. First, I'm going to talk about what makes things burn. Naturally, you're going to say oxygen, or combustion process, or maybe an independent fuel source. Well, we do know about what makes things burn today. Way back when, it was a different story. It was a mystery. Johann J. Becher put out (ha!) his theory of phlogiston in 1667. (Surprisingly, Wikipedia has a very good article on the subject.) Basically, stuff burned because it contained this ingredient. No phlogiston, no burning. You may be tempted to laugh at it today because science has left the theory behind over a hundred years ago, but it was an attempt to work through and explain the observed phenomenon of burning. It was also used to explain rusting, but there is no need to make this discussion more complicated. Besides, the fire stuff is more fun. Phlogiston had no weight, smell, taste and so on, but it was required to make things go up in flames. The theory became refined and popularized, and lasted about two hundred years. Eventually, scientists became skeptical because their experiments gave results that did not fit the theory. What happened? Further explanations and refinements that read more like excuses than anything else ("negative weight", "lighter than air" and so on). It took Lavoisier's experiments to show that oxygen was what was making things happen, and that started to bring the phlogiston house down. Not right away, however. Eventually, scientists started saying that it was a principle rather than an actual substance. This is where I step in and say that they were getting desperate. They had their pet theory, and just hated to part with it despite the evidence. "I think I know where this is going, Cowboy Bob." People reject evolution because of their religious viewpoints. Like me, they also reject it because of its lack of scientific merits. That is, it has so many holes that you can drive a wagon train through it. Darwin's "theory" has fewer merits than the phlogiston concept. What actions do Darwinists take when confronted with contrary evidence? Make excuses, dodge the truth, reject said contrary evidence, and so on. Simply put, they are believing because they want to, not because of ironclad evidence. Cowboy up and face it: evolution is a faith system. We are bombarded with evolution as "true science". It's everywhere. Television, movies, music, cartoons for the kids, alleged science publications, conversation between friends — all presenting evolution as unquestioned "fact", even though the evolutionists themselves are at odds with "how it happened". Let's be blunt. To present only one side of the issue is not only propaganda, it's brainwashing. Since evolutionism has taken on a religious life of its own (in addition to being foundational for atheism, Nazism, Communism, eugenics and other evils of society), its adherents deal harshly with dissenters. When scientists reject evolutionary "theory" and see that the evidence actually leads to Intelligent Design, they have to either clam up or get ostracized by the orthodox evolutionist community. They are written off as religious kooks, but the truth is that they followed where the science led them. Evolution is today's phlogiston. Scientists are locked into their beliefs even worse than the phlogiston proponents seemed to be, however. Perhaps someday, they will follow where the science leads. In the mean time, we have to deal with fundamentalist evolutionary propaganda, excuses, modifications, theory upon theory upon theory and doing anything else to avoid the truth of creation. Doesn't that just burn you up?